Status: The DVD is being produced. In the meantime, everyone who has pre-ordered it can request to learn it over Skype, Google Hangout or otherwise. We might also soon release a downloadable video featuring all the basics so that one could learn it already without needing to remember it from the Skype sessions. Make three ordinary coins penetrate any general drinking glass, one after the other. 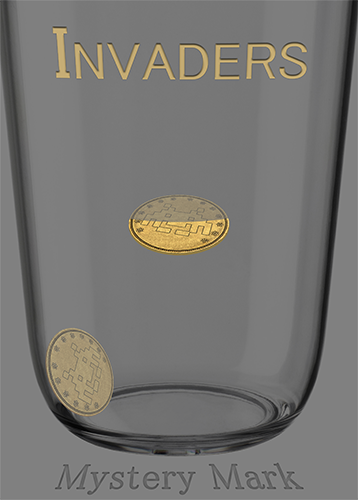 This DVD contains Mystery Mark's 'Invaders' routine and over twenty techniques you can use to magically get coins either into or out of a glass. Everything is completely impromptu and both the glass and coins can be borrowed. Want to gather knowledge regarding some of the most practical angle-proof 'Coin Through Glass' techniques out there? Then this is the way to go. A lot of techniques with variations to make coins seemingly penetrate a drinking glass. Since shipping to Singapore is so expensive can you get it as a download? Thanks a lot for your everlasting support. Much appreciated! Sorry but this is and will not be available as a download. However, we can honestly say that what you get on this DVD would have a value of $30-$35 at other sellers. Keeping that in mind, the shipping is not all that bad. Please bear with us as the shipping fees are really that high over here. When it says "Tens of techniques" Does that mean 'tens' is plural and there are twenty or more? Or just more than ten? Either way, I'm very excited. And I considered getting Filter, Ha! Twenty or more. We will clear this up a little. Thanks! How much would it be to ship to Singapore? Haha, first you say shipping is expensive, now you ask how much it is? Just check the Store and find out shipping a single DVD to Singapore costs $8.91. I think I gotta clear up this is not a one-trick thing like 'Infusion' or 'Filter'. You will get the 'Impromptu Glass Penetration' (also known as 'Infusion' which is sold by Ellusionist for $15) and if you would see the rest as 'Filter' (which is sold for $20) although it is much more and much more practical than that, this DVD is a true steal, even with shipping included. Yeah ! I know but i won't have this DVD LOL ( NO MONEY) haha So BAD ! when would i get the dvd after i order it=]? We are aiming at the status mentioned in the main post, right underneath the title. Does the routine look like 'Filter' in that you have to drop the rest of the coins into the glass when you "penetrate" a coin, or do they really go in one at a time? Really one at a time, one by one, no pre-dropping required. I'd be ashamed if that'd be the case. I know, that's one of the things I really didn't like about 'Filter', it just makes it so much less magical. Now I really just can't wait to get this DVD! I know your YT channel is gone, but could you perhaps make a downloadable performance video? It would be nice to see what effects we will get, aside from Infusion.